The primary challenge for removing haze from a single image is lack of decomposition cues between the original light transport and airlight scattering in a scene. Many dehazing algorithms start from an assumption on natural image statistics to estimate airlight from sparse cues. The sparsely estimated airlight cues need to be propagated according to the local density of airlight in the form of a transmission map, which allows us to obtain a haze-free image by subtracting airlight from the hazy input. Traditional airlight-propagation methods rely on ordinary regularization on a grid random field, which often results in isolated haze artifacts when they fail in estimating local density of airlight properly. In this work, we propose a non-local regularization method for dehazing by combining Markov random fields (MRFs) with nearest-neighbor fields (NNFs) extracted from the hazy input using the PatchMatch algorithm. Our method starts from the insightful observation that the extracted NNFs can associate pixels at the similar depth. Since regional haze in the atmosphere is correlated with its depth, we can allow propagation across the iso-depth pixels with the MRF-based regularization problem with the NNFs. Our results validate how our method can restore a wide range of hazy images of natural landscape clearly without suffering from haze isolation artifacts. Also, our regularization method is directly applicable to various dehazing methods. The online version of this chapter ( https://doi.org/10.1007/978-3-030-12209-6_11) contains supplementary material, which is available to authorized users. 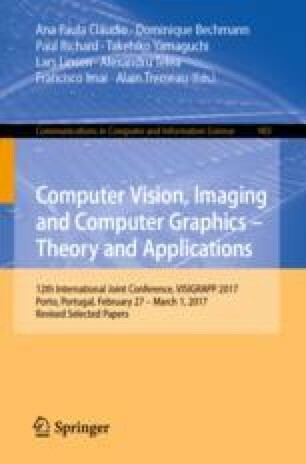 The initial version of this manuscript was published in conference proceedings of International Conference on Computer Vision, Theory and Applications (VISAPP 2017) . This paper was invited to be published in the Communications in Computer and Information Science series by Springer afterward. It is a revised and extended version of the conference paper to additionally introduce more scientific analysis and evaluation on the proposed method. Min H. Kim, the corresponding author, acknowledges Korea NRF grants (2016R1-A2B2013031, 2013M3A6A6073718) and additional support by KOCCA in MCST of Korea, Cross-Ministry Giga KOREA Project (GK17P0200), Samsung Electronics (SRFC-IT1402-02), and an ICT R&D program of MSIT/IITP of Korea (2017-0-00072, 2016-0-00018). We also would like to appreciate Seung-Hwan Baek’s helpful comments.